Recipe from Karen Fondu, President, Maybelline New York / Garnier. This Asian-inspired quick-and-easy meal is sure to please the whole family. 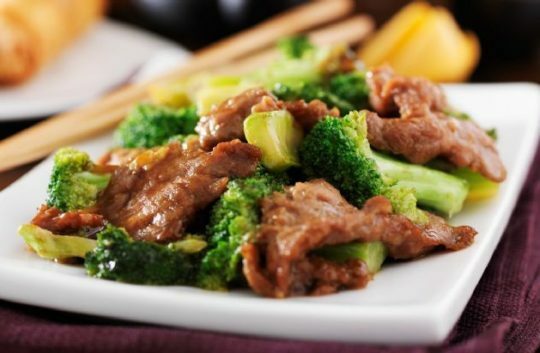 Beef and broccoli combine together to create a wonderful-looking meal. Ginger is a tummy tamer, and it tastes great! Serve over brown rice. Heat oil in skillet until hot, fry meat quickly. When pink is gone, add onion and garlic. Lower heat. Add bouillon, sugar and soy. Just before serving, add cornstarch dissolved in 1/3 cup water. Stir. In separate pan coated with cooking spray or lightly oiled, stir-fry broccoli for 6 minutes or until desired tenderness.